One of the key factors in successful equipment design is the calculation of O ring squeeze. The amount the O ring will be squeezed by the surrounding hardware can have a bearing on the material selection, design and other key characteristics. What exactly is O ring squeeze? O ring squeeze is the amount that the ring will deform when pressure is applied. O rings only work as seals because of deformation, as they ‘flow’ to fill the gland, blocking any leakage from the assembly. Virtually every gland has a tiny gap between the two mating surfaces, called a diametrical gap. This means that the O ring needs to be larger, in terms of cross sectional height, than the height of the gland. 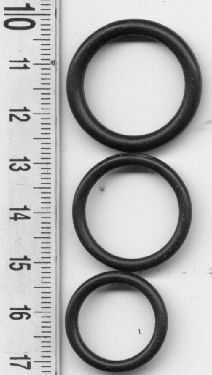 When the O ring is squeezed, it expands into the gap and forms a complete seal. How much squeeze is enough? To get the right amount of squeeze for the best seal, consideration has to be given to both the size of the O ring itself and the type of application being used. In a dynamic application, a lower squeeze is preferred as it will reduce friction and therefore wear on the seal. With little or no squeeze applied, the natural elastometric characteristics of the O ring will prevent liquids from passing through. However, in situations where gasses need to be confined, a greater amount of squeeze is required to prevent passage through the hardware. Increasing squeeze will tighten the seal, but should you always specify a high level of squeeze? Some might say that the more an O ring is squeezed, the tighter the resultant seal will be. The greater the squeeze, the greater the force between the O ring and the mating hardware. This increase in force will do an even better job of preventing liquids, gasses and powders from escaping the seal. Or will it? While a strong squeeze is desirable for a good seal, it’s not always a case of more is better. The more forcefully an O ring needs to be squeezed at installation, the higher the risk of creating a pinch, and therefore a pathway for leaks. Squeezing forces rise exponentially, so an increase in squeeze on the O ring could, in fact, lead to excessive stresses on the hardware and, potentially, to damage. Higher squeeze also comes with a risk of greater friction and therefore faster wear. In short, squeeze is not something to be maximised, rather something that needs to be optimised. There’s no hard and fast rule for the amount of squeeze you need in our O ring. In very general terms, a squeeze percentage of 13 – 27% is typical for hydraulic operations, and 10 – 24% for pneumatic. However, these figures can change based on the materials in use and other factors such as temperature and environmental influences. If you’re unsure, the best option is to seek expert advice. Our team are always on hand to help; just get in touch to find out more.